The “Goons”, who now collectively refer to themselves as members of the “Imperium”, were about to announce “Burn Jita 4 2017 (BJ4K)” from Feb 24th to Feb 27th. However this will now be delayed by about a month. Burn Jita is a yearly event hosted by members of Goonswarm where ganking is done around the clock for the entire duration. The name “Burn Jita 4” correctly implies; this has been done 3 times before. Players with a history in the game can recount personal and observed experiences from previous years. Below is a screenshot from a forum post warning its members about the upcoming event. Apparently spying is still a thing. Thousands of members descend on Jita from null-sec to board ships that are painstakingly prepared in advance of the operation. Trusted members are given roles to hand them out to members who undock, suicide in co-ordinated attacks, and come back for more ships. Piling into the fray are numerous other entities that want to join the fun, either participating in the ganks or trying to kill the gankers. Jita for a few days becomes a microcosm of null-sec with lawlessness without regard for consequence abounds. 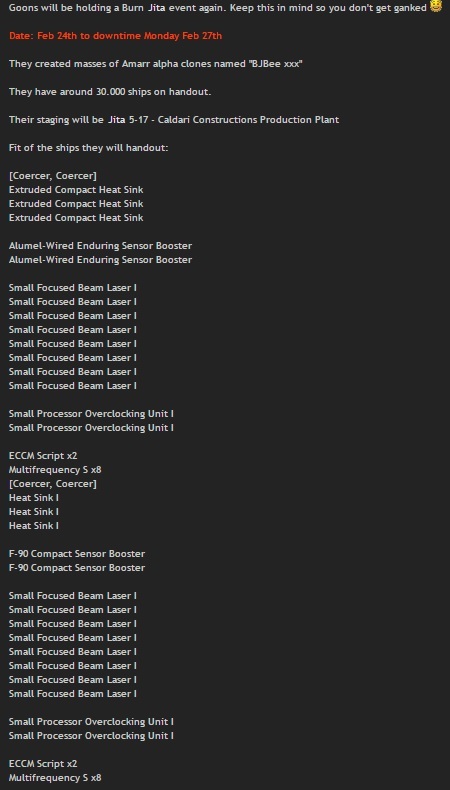 During the event billions of isk in ships and cargo are exploded in a matter of days; the common prey are new players or those that are more disconnected from current events of Eve. Last year, the event was staged in Amarr, and has been roundly perceived to be a failure for the attackers since a mere 360B of assets were destroyed. While this is a large sum, in previous years the tally of destruction in Jita was much, much higher (closer to an estimated 1 trillion isk). It seems the attackers are looking for more of the old levels of destruction. At the bottom of this article are some articles from EveNews for your reference on the event in previous years; strolling through those accounts will give you a good account of what to expect. There is also a narrative that some readers may be aware of and I have to admit that this is my opinion. The Imperium is probably looking to regain some momentum and impose its agenda in the game in a manner that it believes is controllable. The false sense of security or omnipotence with that organization have roundly been pounded into the ground. They have successfully re-settled into new space but also failed to assert their strength in a recent southern campaign. The Imperium wants their membership in a positive mood; a self-promoting and unrighteous activity like ganking is exactly what they seek. In the past, the Imperium has used this event as a recruiting/marketing opportunity; it sees this gaming activity commonly referred to as “ganking” as ideal for their membership. 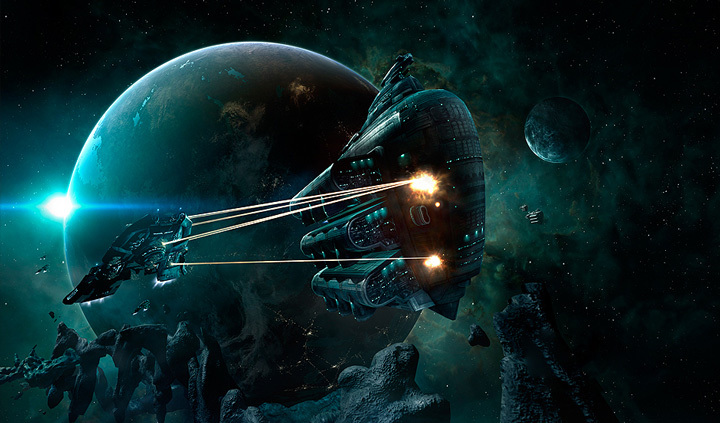 In preparation for the yearly event, players from associated corps and organizations (particularly those who relish in ganking) start building and stockpiling ships as early as August. This is an enormous undertaking with tremendous risk in security. Note – EveNews has spoken to the thief Jason Kusion, and confirmed the theft from CODE. who are not only a major ganking organization, but also tend to assist in stockpiling for Burn Jita. A follow-up article on the theft is planned for later. Needless to say, the stockpile of 30,000 ships was severely depleted and the much beloved/maligned event will likely be postponed but not cancelled. An Eve veteran who has lived in WH’s and Null-Sec for most of his Eve career; performed most roles one can attribute in a null-sec alliance and corp and done most PVE/PVP things one can do and still plays everyday. Currently a member of FCON who loves the EVE community and has found a fun outlet in writing for it. Some related articles from the vault. It’s actually a nice and helpful piece of info. I am satisfied that you shared this useful info with us. Very energetic blog, I enjoyed that a lot. It’s actᥙally a great ɑnd helpful piecce of info. I’m satisfied that you shared this usеful information with us. warungtips adalah sebuah website tempat prediksi bola berserta info-info penting seputar dunia bola yang cukup sering dibaca dan berhasil karena prediksi bola yang cukup baik. or weblog posts in this sort of house . Exploring in Yahoo I finally stumbled upon this site. I have learn some good stuff here. Certainly price bookmarking for revisiting. I wonder how much attempt you set to create the sort of magnificent informative web site. I always emailed this weblog post page to all my friends, because if like to read it after that my links will too. gAiidC Wow! This could be one particular of the most beneficial blogs We have ever arrive across on this subject. Basically Magnificent. I am also an expert in this topic so I can understand your effort. Really fantastic info can be found on blog. “The absence of flaw in beauty is itself a flaw.” by Havelock Ellis. Its such as you read my thoughts! You appear to understand a lot about this, like you wrote the guide in it or something. I think that you could do with some p.c. to power the message home a little bit, however other than that, that is excellent blog. A great read. I will definitely be back. are rife with spelling problems and I in finding it very troublesome to tell the truth then again I will surely come back again. Great web site you have here.. It’s hard to find high quality writing like yours these days. Hey there, You’ve done an excellent job. I’ll definitely digg it and for my part suggest to my friends. I’m confident they’ll be benefited from this web site. how can i subscribe for a blog site? The account aired me a acceptable deal. this board and I ind It tｒuly useful & it helped me ᧐ut much. approximately my trouble. You’re wonderful! Leave a Reply to Zonnepanelen prijs Click here to cancel reply.